Shortly before Christmas in 2018, a new space was opened in the courtyard at Mäsiarska Street. 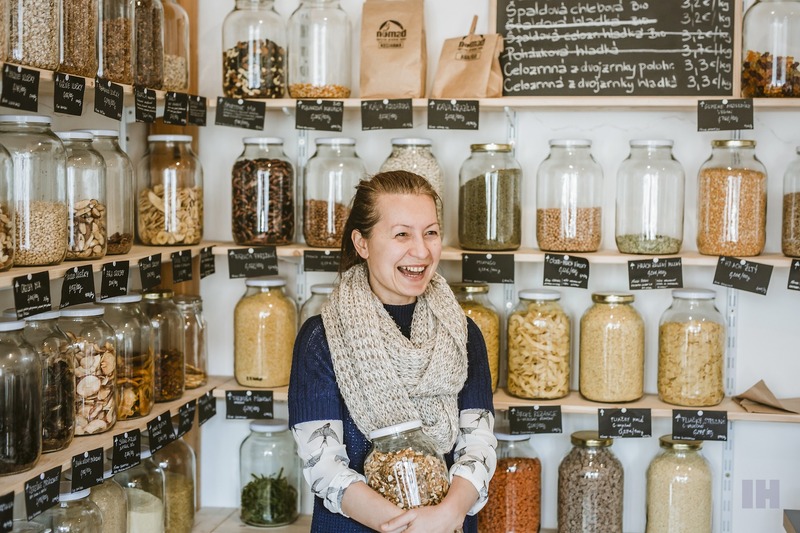 The long-awaited project of two chefs from the most well-known vegetarian and vegan restaurant/tea shop in the city has started gradually by collecting experience and, in fact, seeking finance. Richard Rabatin and Viktor Nemergut have been enjoying their new job for several months now. 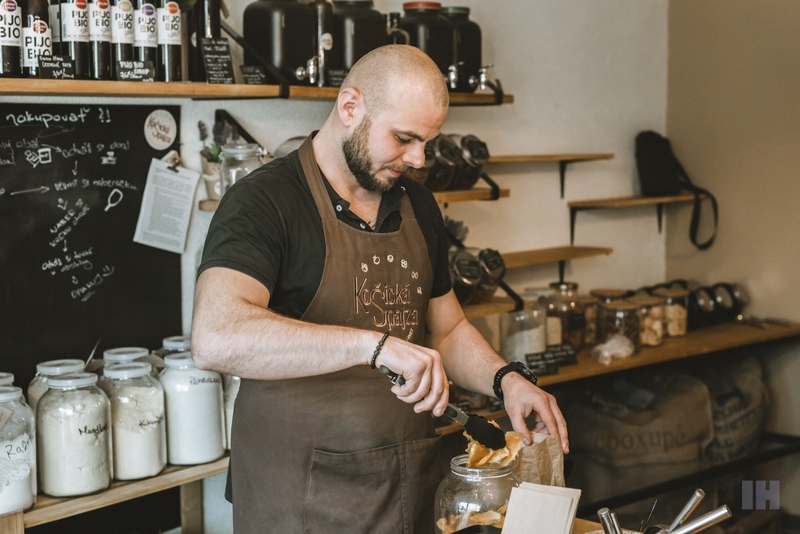 Through a grocery/drugstore shop and a café with hand-painted menu illustrations they want to support the Slovak economy: “We are observing the life around us and how the consumer society works. Because of that, we wanted to create something to help reduce waste and motivate others for a change. People come here often and we believe that they will shop in this way more and more. Everything we offer cannot be produced by Slovak farmers, but we want to focus primarily on our local and Slovak market in the future, ” says Richard. 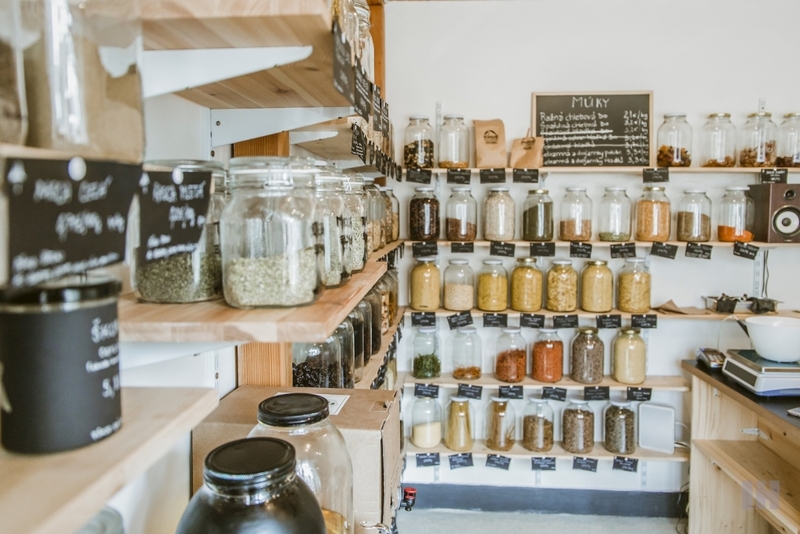 In Jednoducho Neodpadovo, you can buy Slovak spices such as cumin, pepper, marjoram, rapeseed oil, lentils, honey, herbs or wholegrain, spelt or buckwheat pasta. The lovely bonus of this shop is Ester Šefčíková, a tiny figure in a folk dress from Košice, well-known in clay and coffee social circles. 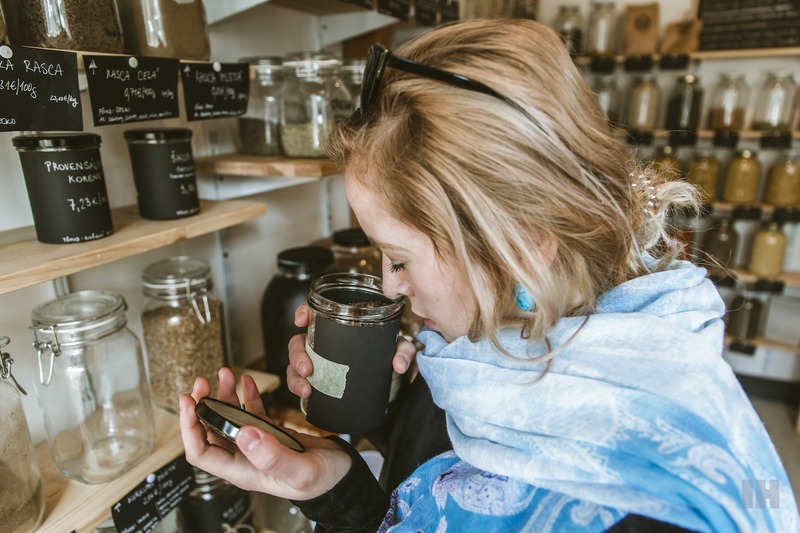 Ester knows so much about herbs and their infusions, macerates, decoctions, and tinctures that she‘ll prepare you the most suitable drink with the proper use of the plant’s potential and make you laugh so hard that you can easily forget that you came just for half an hour. 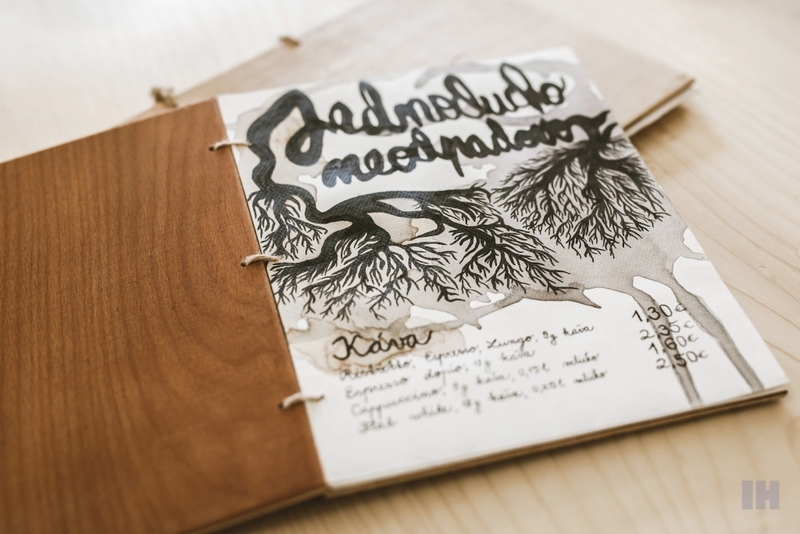 You wouldn’t even believe how Frida Kahlo’s personality could act in the East Slovak dialect. TIP: You can order a freshly baked cake every day or buy sourdough or classic yeast bread right from the oven. And Thursday’s are completely gluten-free. 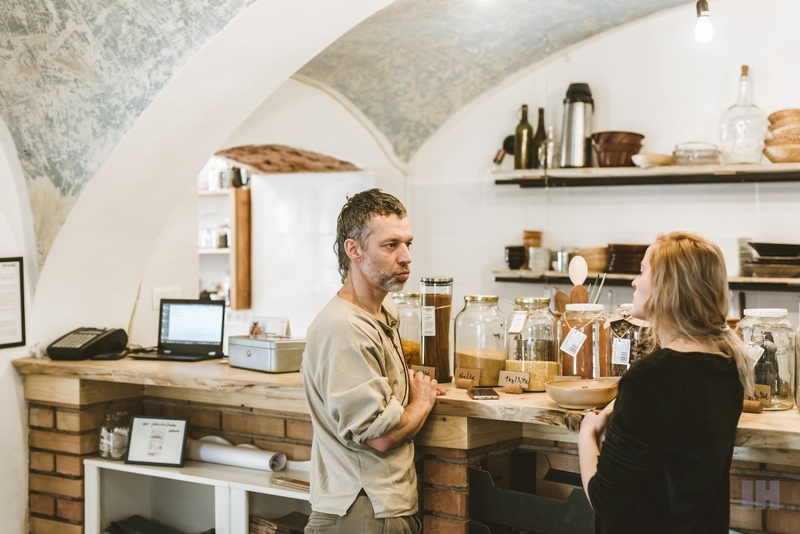 Lukáš Majerník, born and raised in Košice, decided to return to his home town and start a zero-waste shop business inspired by a similar store in his previous home after years spent in Dubnica nad Váhom. He claims to have converted with hIS family to this type of shopping over time. 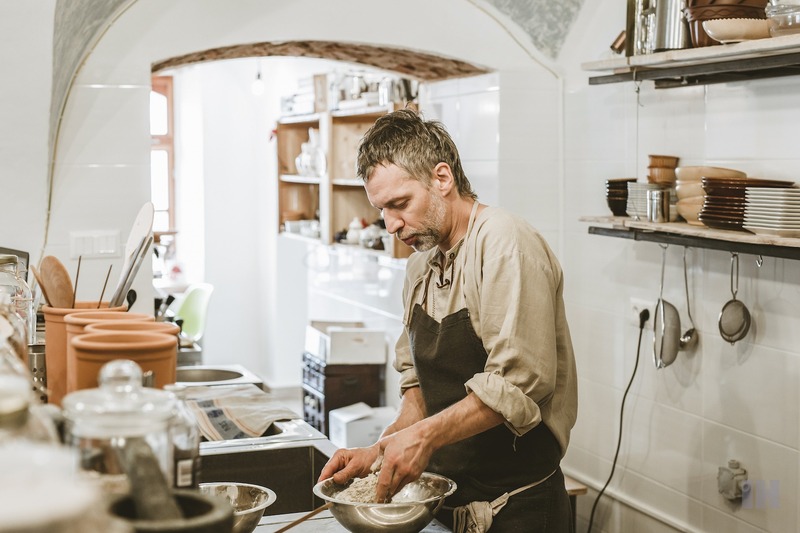 Talking about the aesthetic neatness of food at home after removing a lot of plastic bags, Lukáš told us how all the values ​​changed after the birth of his children: “I look at the future and I consider multiple angles when thinking about my kids. It is not just about saving money and financial security, but also providing a place for the next generation and our children to live, and that I mean not among the rubbish. 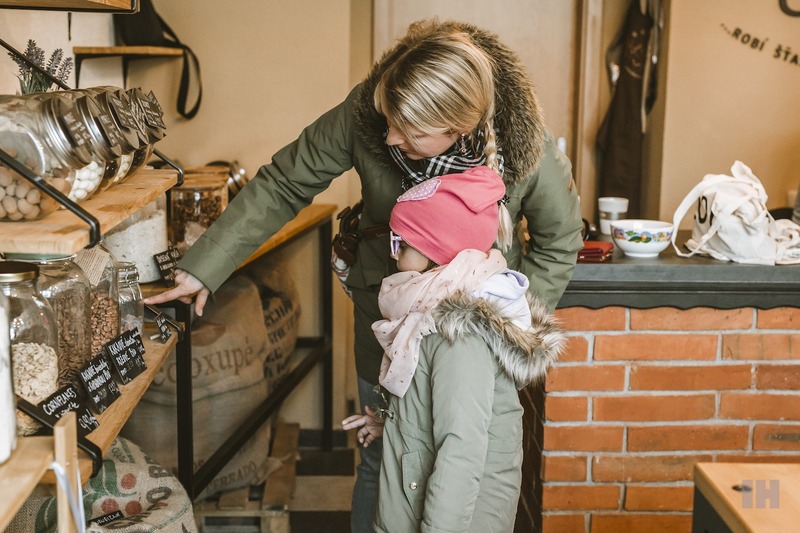 I want to be able to say with a full conscience that I have done as much as I could for their future.” Masarykova Street is definitely a useful place on the Košice map if you wish to step out a bit further away from the centre and purchase in total peace and alone. With a ladle. 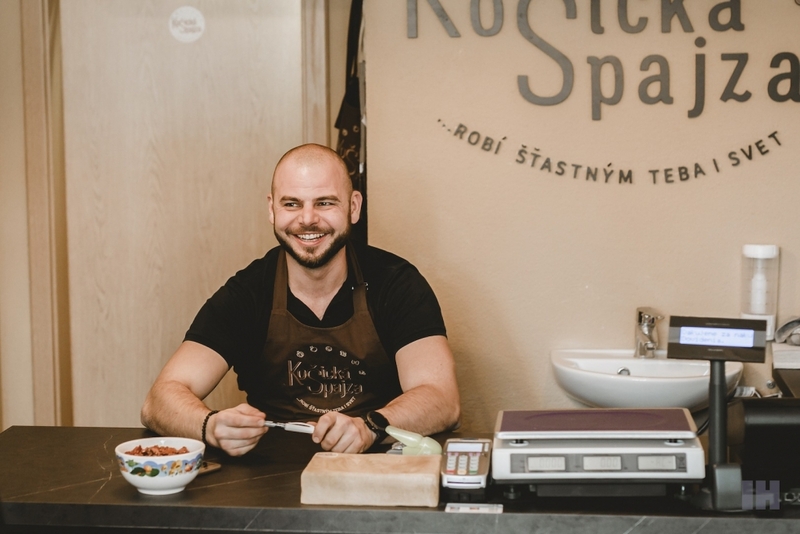 A friend of Lukáš also comments on how entertaining this kind of shopping has become to him and how much flavour the ingredient has. 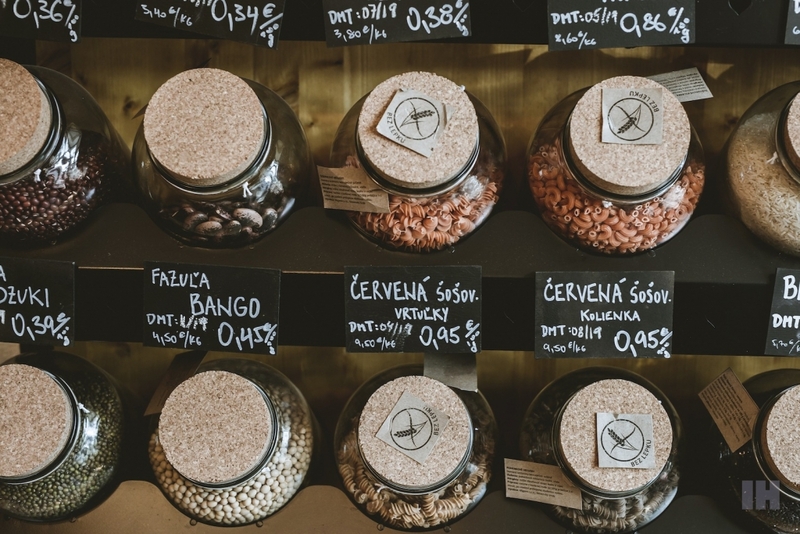 He emphasizes that the price of zero-waste groceries is actually cheaper than artificial or canned food from the supermarket. 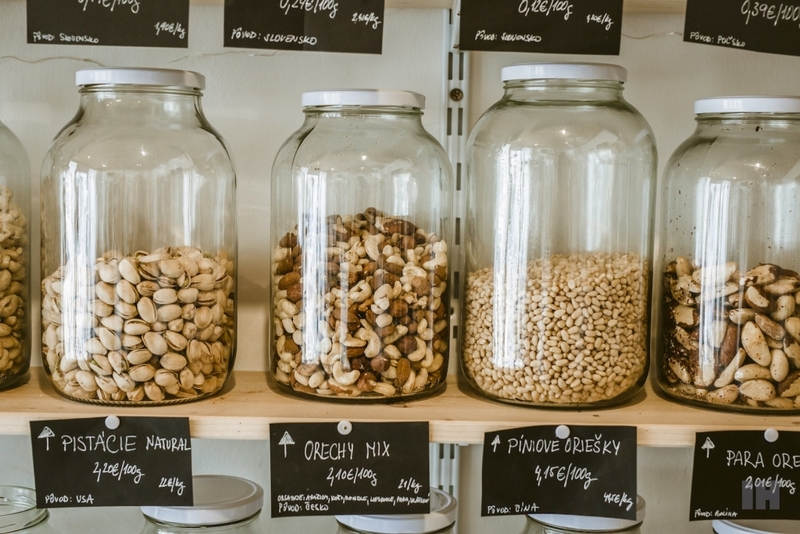 Košická Špajza offers a wide range of dried fruit for sale, some of which have been freeze-dried, which is known as the most gentle way of preserving over 90% of the original quality of the fruit. Here you‘ll find raspberries, strawberries, chokeberry, peaches, plums, pitahaya but also the-usual-way dried fruits without sulphates such as tropical mango. TIP: Taste the combinatorics of different nuts with variations of chocolates or wasabi flavors at an excellent price. Recommendation goes for… cashew in milk chocolate. 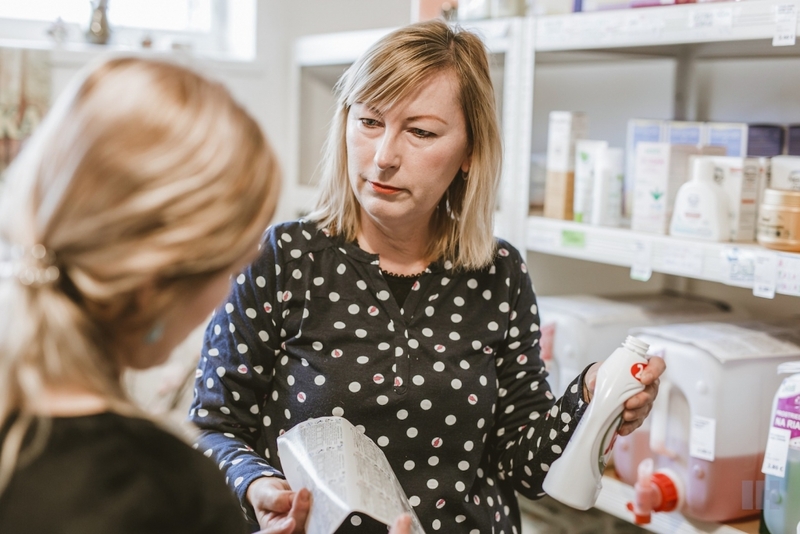 A lot has been written about Saša Varšová in the media – she was the first founder of the package-free vibe in Košice. The Invisible Mag has already released a cool video about her shop in the last year. 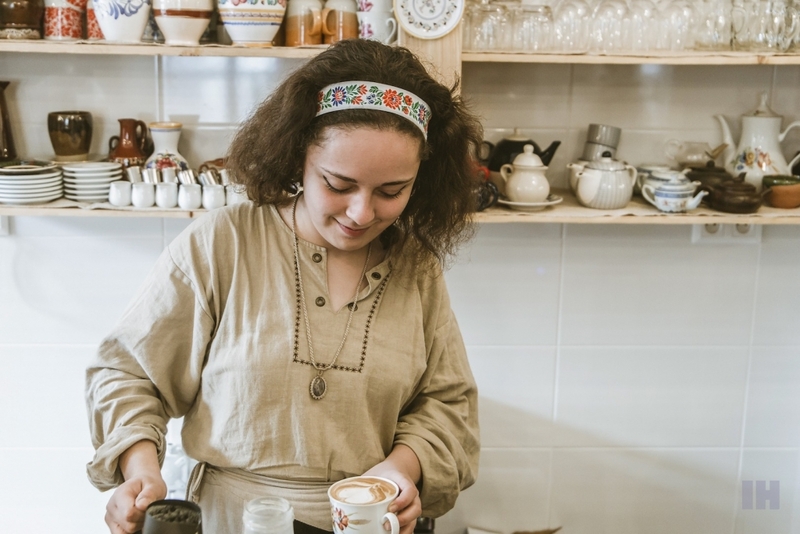 Thanks to her travels through India and Mexico and buying zero-waste products in Barcelona, she came up with an idea how to change her life and the rest of Košice residents. Returning to her hometown, she decided to take things into her own hands and open up a rather risky spot at Park Angelinum. 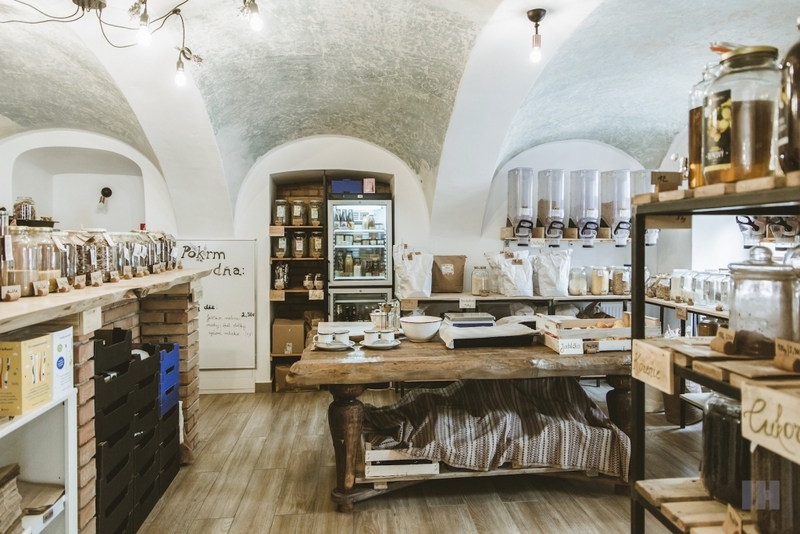 This small room, full of tanks of Slovak pasta, is a suitable choice for the purchase of spices – with the newest variety of cardamom, Provencal spices with lavender or Ceylon cinnamon. Saša points out that Na kôpke presents “a completely different shopping experience compared to the supermarket light and sound concentrate heard in advert announcements. 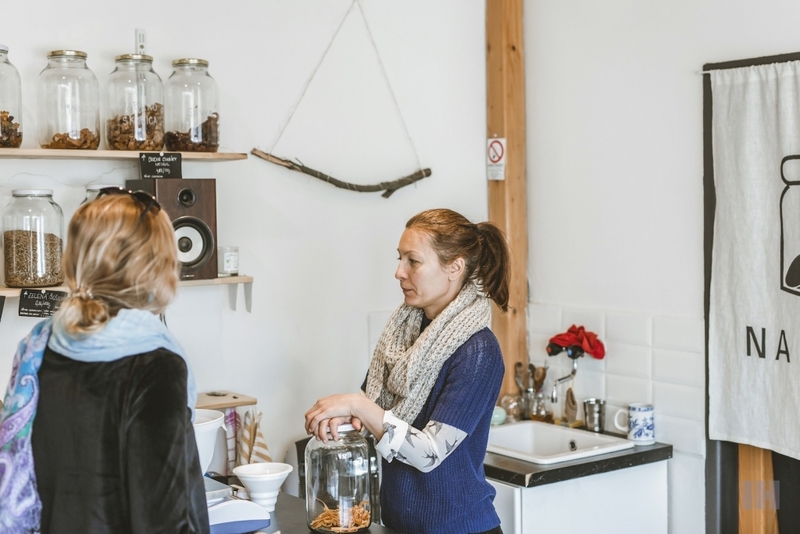 My customers come here to chat, calm down, they often feel as if on therapy. I know every single customer I have and I’m interested in their fates. 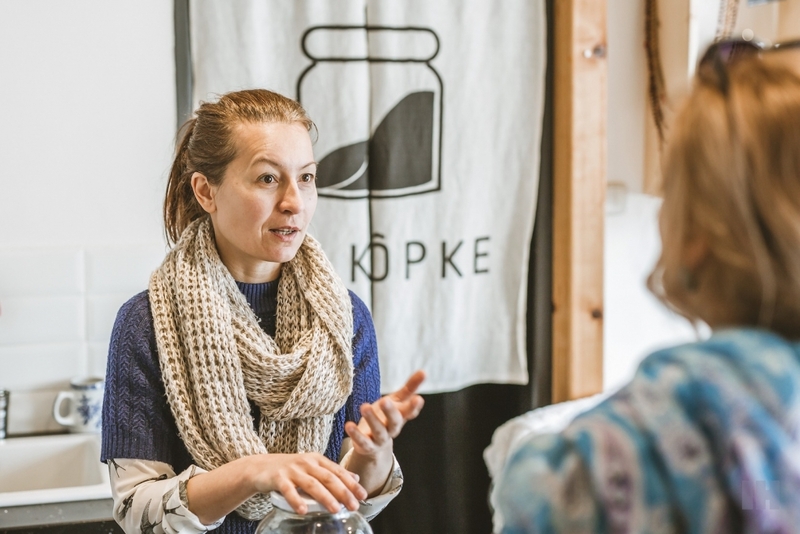 All the shopping is suddenly about real life interaction and not the beeping of till.” Saša is aware of the shortages of Slovak suppliers, and despite trying to order mostly Slovak products, she needs to sell foreign as well. What is essentially important to her is the quality of the food itself and the health of the ingredient. TIP: Invest in uncooked and uncooked dried fruit or choose from a variety of flakes or extra virgin olive oil pressed cold. Anna Bérešová was looking for new ways of doing business. 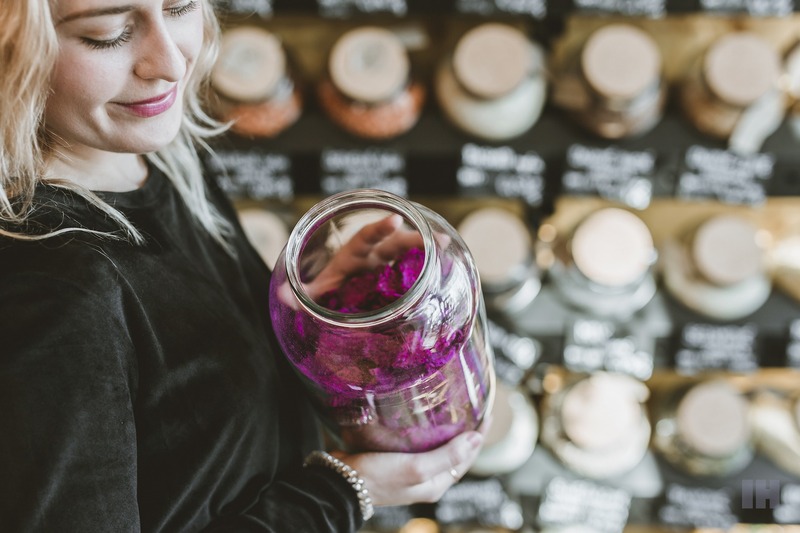 She has always inclined towards some means of saving and coincidentally has encountered the ecological brand Delizia, widespread in Italy and its numerous European branches. 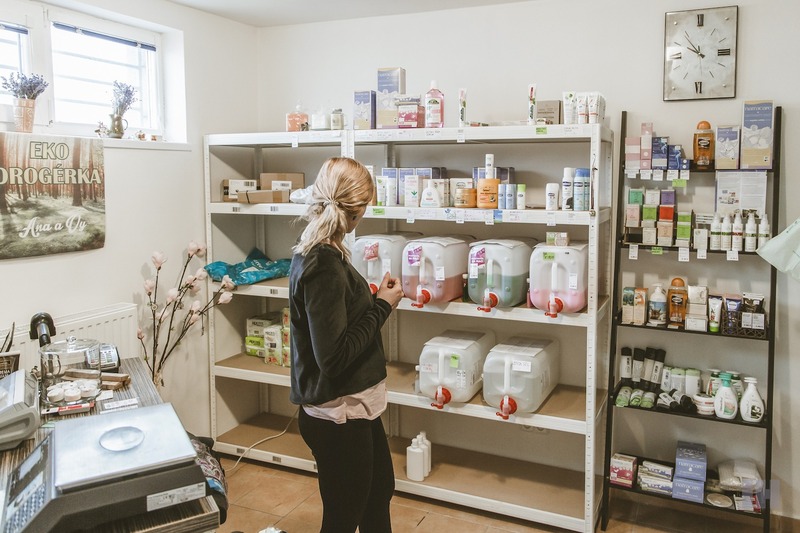 After testing the products on her own skin, she opened her first package-free eco-drugstore at Ludmanská Street. Here, you can bring your own tank to which you can choose any amount assortment she sells. It’s true that Delizia is not of plant origin, but is produced with a finer chemical composition, whose solution is naturally degradable to more than 90%: “This drugstore is of higher quality and is recommended mainly to hospitals, restaurants, schools. It is suitable for a sewage treatment plant or septic tank. The Slovak distributor is located in Žilina, where all the containers I have in here are sent to for further recycling. This is the fourth year for Delizia products in Slovakia and there are roughly 40 shops in the country. In my opinion, everyone has to start a bit if we want to change something,” says Anna. 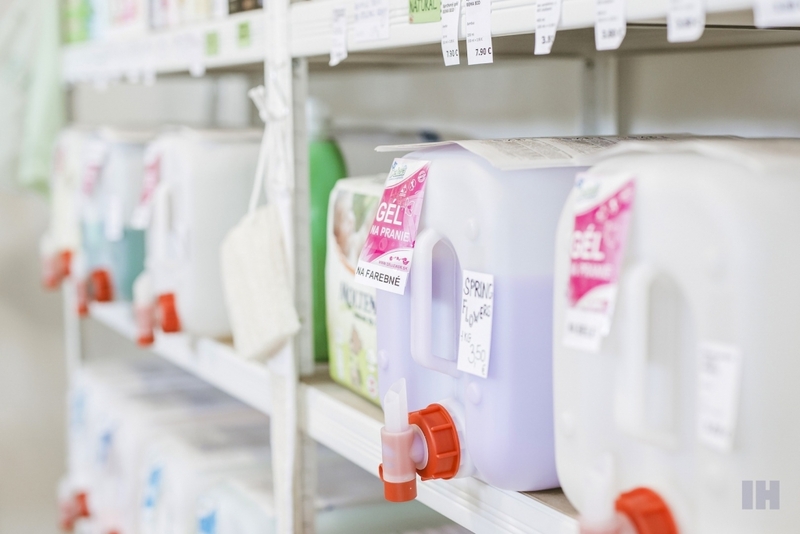 All kinds of softener and laundry gel fragrances are available, with only 50 ml per individual cycle. If you don’t have your own bottle with you, some containers are either free or for sale. 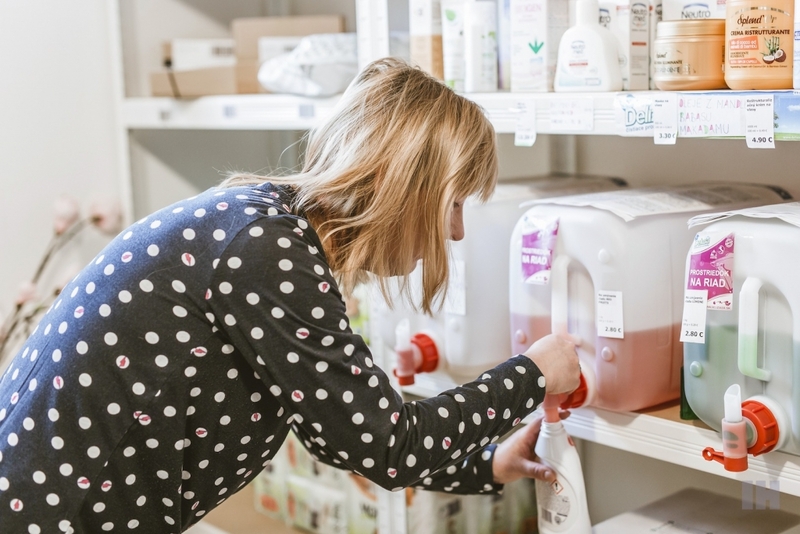 Anna also distributes other non-zero-waste items of Slovak cosmetics in her Ekologická čapovaná drogéria. 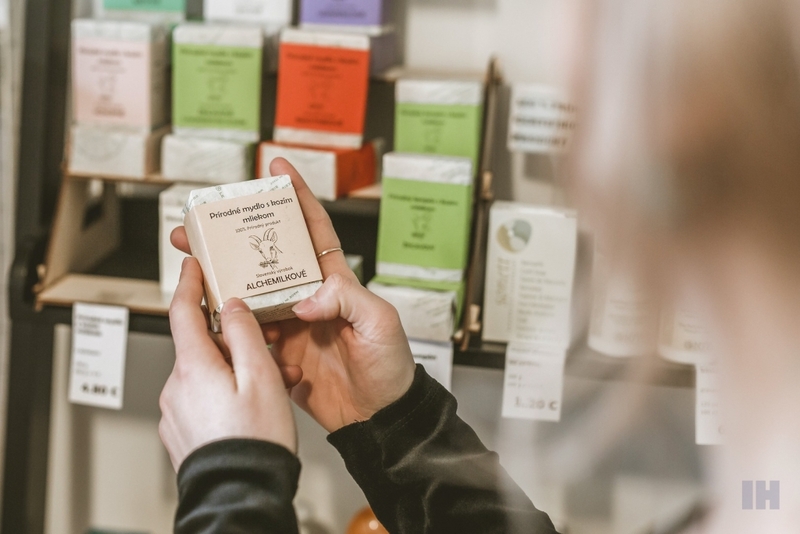 TIP: Bio soap with a high percentage of goat milk from local Čergov production. Bottles, jars, bags, packs. If you don’t have a place to sleep in Košice, you can bring everything you’ve bought to any of The Invisible Hotel room. 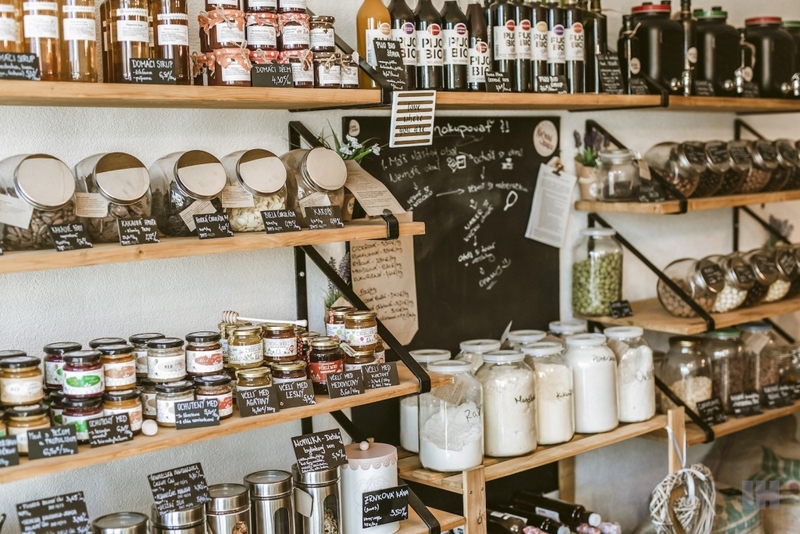 We will make sure that you get a special your Welcome Pack with local products into your hands – completely free of charge.